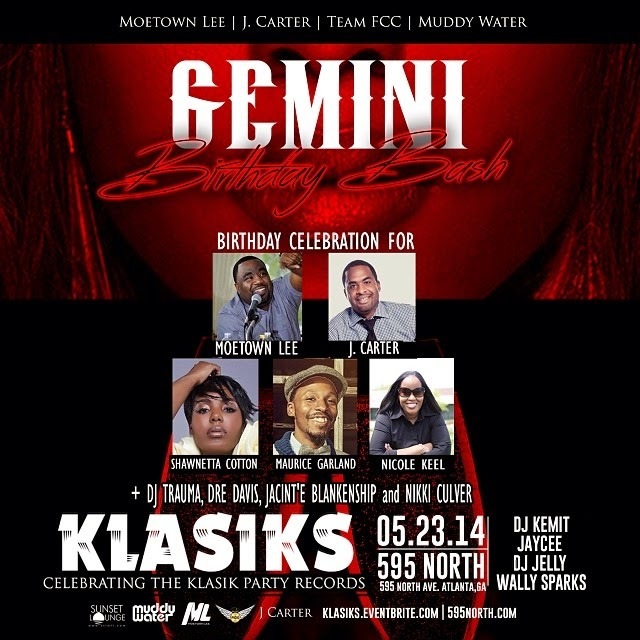 THIS TIME KLASIKS WILL BE CELEBRATING WITH THE GEMINI. YOU KNOW THE FOLKS THAT MAKE THE WORLD GO ROUND!!!!!!!!!!!!!!! Special Gemini shot out to Moetown Lee, J. Carter, DJ Trauma, Cee Lo Green, Nikole Keel, Maurice Garland, Jacinta Howard, Soloman " DJ JackMaster", Shawnetta Cotton, Arnesha Henry, Jacint'e Blakenship, Adrian Marcel, Cynthia Charles, Keisha Russell, Andre Benjamin, Denice Cooper, Faven Ressom, Nikki Culver, Lauren Johnson, Tulashi Sawyer, Ron Hurd, Tiwa Works, Ike Dirty, Soloman Anderson, Bridgette Huggins, Shonae Jacobs, Nefertiti Robinson & too all the Gemini out there every where. Others will never understand how we make being this special look so easy. Klasiks is all about party music. The music that makes you wanna sing along and just move like nobody's watching. To everyone that supported "Klasiks" you guys made the night! It was definitely good times had by all. If you came you know they story if you didn't here's 5 things we learned at "Klasiks"
1. Goodie Mob was wrong "People still dance"
2. A dance floor can be a great substitute for the gym. 3. Who needs a celebrity host. 5. In the words of Run DMC "Go* Damn those DJ's made my day"